Who am I? In The Vertical Self, Mark Sayers contends that we are experiencing a cultural shift unprecedented in human history. For millennia, humanity has been understood vertically; that is, in light of the revelation that every man, woman, and child bears the image of the God (Genesis 1.26-27). Now, however, Sayers contends that our answers to the question of identity are rooted horizontally; cultural norms, economic status, and public media depictions have given rise to a sense of self that is far removed from any concept of the Divine. The key to true self understanding, Sayers argues, is to recover the ancient truths found in Scripture. Overall, The Vertical Self is a well-written and highly accessible read. Sayers never belabors his points and he fleshes out his theology with relevant illustrations from both popular culture and his own pastoral experience. The volume’s high point is the tenth chapter; Sayers invites readers to acquaint themselves with their “future self”, the eschatological self fully formed in the image of Christ. Sayers aptly navigates through a discussion of flesh (sarx) and the importance of bringing our desires under the lordship of Christ. A ten page Study Guide appendix is designed to carry the conversation forward in smaller discipleship groups. By way of critique, Sayers could use some more contemporary research; his end notes are littered with texts written in the 1990s or earlier. This isn’t a tremendous negative, but I would like to see a greater inclusion of more recent texts. But this is nitpicking. 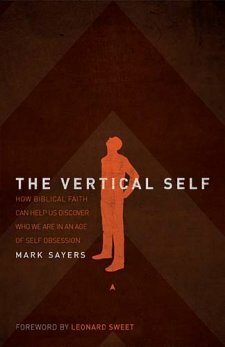 Mark Sayers has produced an intelligible treatise that calls readers to re-embrace a vertical understanding of self flowing from the image of God. Wish our sunday school class would study this! It’s good stuff. I’d recommend it for a small group / Life group study as well. The Study Guide in the back makes it conducive for that kind of study.